Lama Chönam aka Chöying Namgyal is a direct disciple of Khenpo Munsel and of Khenpo Jikme Phuntsok who, after having left Golok in 1992, came to the United States and founded the Light of Berotsana Translation Group. Lama Chönam was born in 1964 in the Golok Ah Kyong region of Tibet. Ngülchu Tomay's Practices of the Heirs to the Victorious One. From Tülku Kadag, Lama Chönam received the teachings of the Longchen Nyingtik tradition. From Khenpo Tendzin, he received the teachings of Avalokiteshvara as well as the vows and instructions for bodhisattvas. From the rebirth of Katok Khenpo Jorden, he received in their entirety the teachings of the lineage of Rigdzin Düddul Dorje. Lama Chönam’s primary teacher is Khenpo Munsel. From him, he received the complete teachings of the Nyingtik tradition beginning with the Ngöndro, followed by one hundred days of solitary meditation focusing upon the Dzogchen cycle of Trekchö and Tögal, as well as the instructions taken from Jikme Lingpa's Yeshe Lama. For a period of three years, Lama Chönam practiced meditation under the guidance of Khenpo Munsel. Following this time of contemplative practice, Lama Chönam received from Khenpo Munsel the transmission of the Seven Treasures of Longchenpa. From Siddhi Tülku, a disciple of Tulku Dorje Dradül, Lama Chönam received the Dudjom Tersar lineage. From the learned teacher Khenpo Jikme Phuntsok, Lama Chönam received many teachings including a cycle associated with Manjushri. From Orgyen Kusum Lingpa, he received the Chetsün Nyingtik cycle of teachings. From Khenpo Tsöndrü, he received the teachings for Collected works of Patrul Rinpoche and, with Thongphün Tülku, Lama Chönam studied Tibetan calligraphy as well as the Sanskrit alphabet. Lama Chönam received the Rinchen Terdzö from the fourteenth Katok Moktsa Rinpoche. At the conclusion of those teachings, Katok Moktsa Rinpoche honored Lama Chönam by bestowing the title of Khenpo upon him before an assembly of nearly two thousand lamas. Lama Chönam later went to study with the scholar Delek Rabgyay, staying with him for several years, he studied grammar, poetry, history, the tenets of various Buddhist schools, and the minor sciences. In 1990, Lama Chönam left his homeland for India, where he hoped to meet with the Dalai Lama. His hopes met with success and Lama Chönam was able to receive important teachings and words of advice from the Dalai Lama personally. Although he intended to return Golok, Lama Chönam came instead to the United States to help cultivate Buddhist studies in North America. Lama Chönam has lived in the United States since that time and became an American citizen in May of 2000. 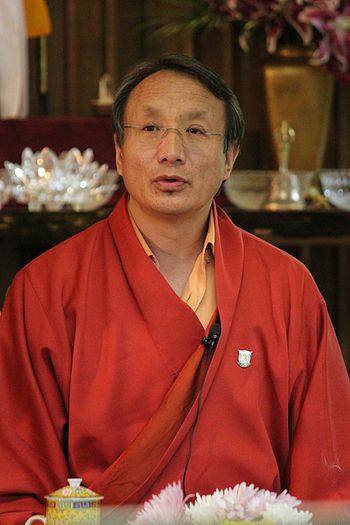 During the past ten years, Lama Chönam has been teaching Buddhist view and meditation as well as the Tibetan language, learning English, assisting in the work of translation, and studying under the guidance of one of his main teacher Thinley Norbu Rinpoche. Lama Chönam has served from 1995-1999 as the senior advisor to Robin Kornman of The University of Wisconsin at Milwaukee and The Tibetan Institute of Literary Studies for the translation of the first three books of the epic poem celebrating and recounting the life of Gesar of Ling. Lama Chönam has served as advisor and teacher to the Nalanda Translation Committee during the past four years and in 1999 helped to establish the Light of Berotsana Translation Group. Lama Chönam serves the group both as president and teacher, overseeing the translation of classical literature and oral commentary. With Sangye Khandro, Lama Chönam has translated The Lives and Liberation of Princess Mandarava, Yeshe Lama, various writings of Thinley Norbu Rinpoche, and Dudjom Lingpa's Tröma Nakmo cycle. ↑ The text is based on Lama Chönam official biography founded on "Light of Berotsana" website. This page was last edited on 23 July 2014, at 20:03.